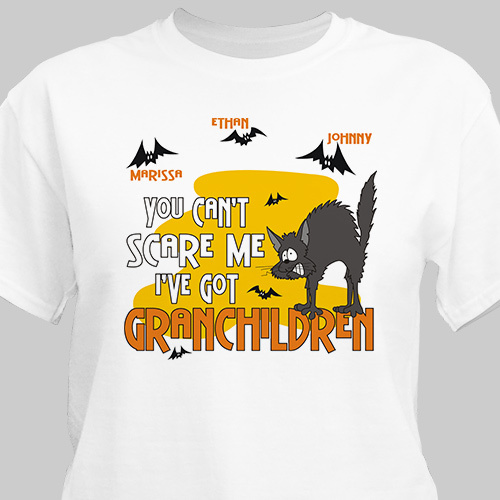 Grandma & Grandpa can now dress up for Halloween with our Can't Scare Me Personalized Halloween Shirt. These novelty Personalized Halloween Shirts are great to wear on Halloween. Each personalized Halloween shirt for Mom, Dad, Grandma or Grandpa makes a unique gift idea for the Fall. Your Custom Printed Halloween T-shirt is available on our premium white 100% cotton T-Shirt, machine washable in adult sizes S-3XL. Also Available on Pink and Ash Gray. Includes FREE Personalization! Personalize your Halloween shirt with any title and up to 30 names. I loved my shirt .I f I had a one to say about it I think that the design should be made in different sizes .If you you have a 2x or 3x shirt the design looks small . I love it now that I have all my grandchildren on it. GiftsForYouNow.com offers a complete selection of Personalized Halloween Gifts for your parents, children or close family members. If you are looking for a Personalized Trick or Treat Bag or perhaps a warm Personalized Halloween Sweatshirt, GiftsForYouNow.com is the right choice with the right price. Shop GiftsForYouNow.com today.